"Bohemians have occupied a semi-subversive status in modern society without being, in any consistent way, political-minded or even organized," writes Paul Buhle at the opening of Bohemians, the graphic history he edited with David Berger that surveys the wide array of figures and moments that have defined American bohemia - in stories illustrated by an all-star cast of comic artists including Spain Rodriguez, Sharon Rudahl, Peter Kuper, and Lance Tooks. 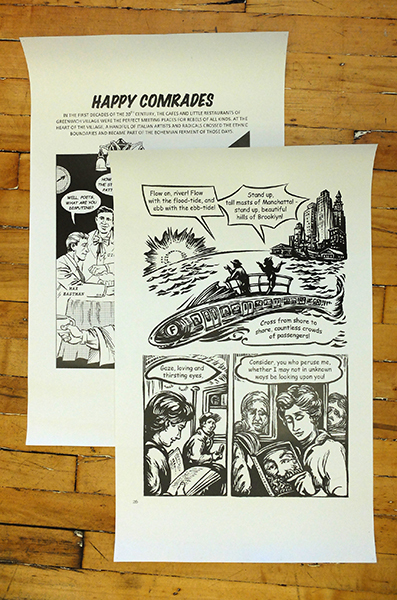 To celebrate the book's release, and the conclusion of an exhibition of illustrations from it at The Gotham Center, we're giving away two 22 x 35" posters with art from Bohemians, along with two copies of the book. 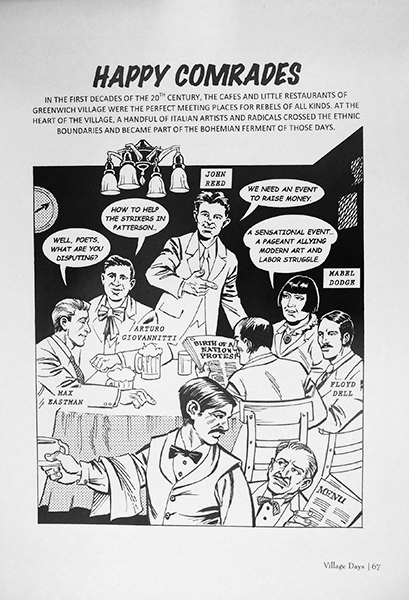 1) Happy Comrades drawn by Steve Stiles and written by Luisa Cetti: A scene from early 20th century Greenwich Village café life and the intersection of art and radical politics, featuring John Reed, Mabel Dodge, Max Eastman, Arturo Giovannitti and Floyd Dell. 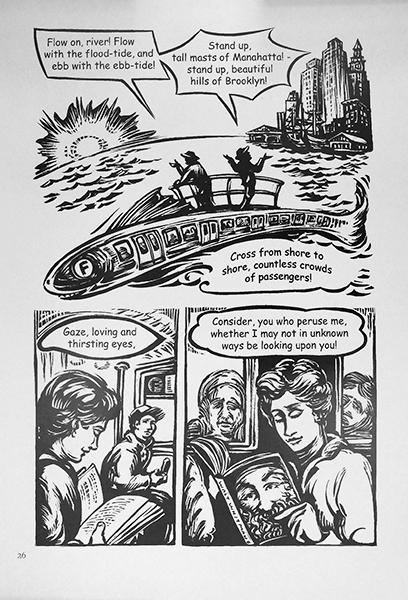 2) From Walt Whitman's "Crossing Brooklyn Ferry", illustrated by Sabrina Jones. 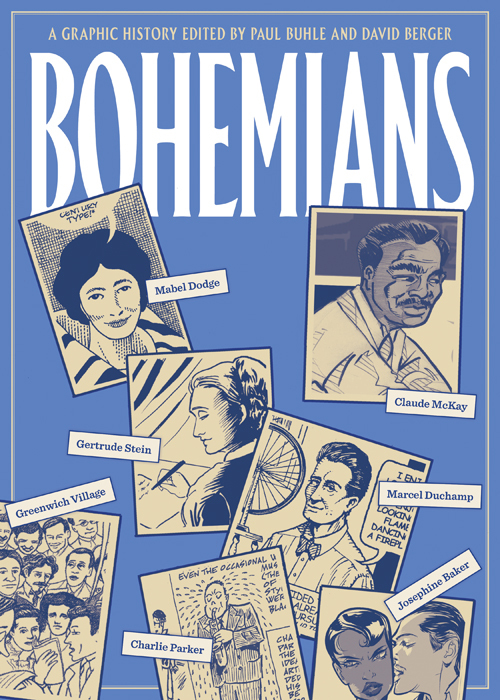 To enter the competition to win one of the posters and a copy of the book, draw a picture of your favorite bohemian, living or dead, and submit it in the comments below, on Twitter, Instagram or on our Facebook wall, using the hashtag #bohemianscontest, and let us know which of the posters you'd prefer. No drawing skills are too poor and no form too degraded: we encourage entries drawn in MS Paint, on cocktail napkins, with an Etch A Sketch or any other prop of the artistically ungifted. Winners will be chosen by a combination of suitably bohemian and vague criteria like wit, perspicacity, persuasiveness, visual pleasure and novelty. Buhle and Berger's survey includes a wide range of figures, spanning from suffragist and Free Lover Victoria Woodhull to Bernard Wolfe, one-time bodyguard to Trotsky, pornographer, and author of Limbo, the first anti-nuke novel; counterculture giants like Oscar Wilde and Josephine Baker to relative obscurities like anarchist poet Joseph Bovshover; short-lived fads like Trilbymania to long-term movements like modern art. We encourage you think as broadly. See more on Bohemians here. The competition starts today (Tuesday, June 17th) and runs for a week, ending on Tuesday, June 24th at 17:00 EST / 22.00 GMT. It is open to readers anywhere in the world (provided you have a working shipping address). You can enter as many times as you like. Winners will be picked by Verso and the winning entries will be posted on our blog after the competition has ended.